A visitor to the Yorkshire coast today will find only one example of that unique form of architecture, the pleasure pier. Clinging to life against all the elements that the North Sea can throw at it, Saltburn by-the-Sea pier is the last remaining of six such piers that were dotted in resorts up and down the county’s coast. Ryde, in the Isle of Wight, was the first resort to build a landing pier back in 1814. This was followed just nine years later by Brighton’s elegant chain pier, which was soon recognised not only as a landing pier, but as a place to promenade up and down – a fashionable place to see and to be seen. In short, the pleasure pier was born. 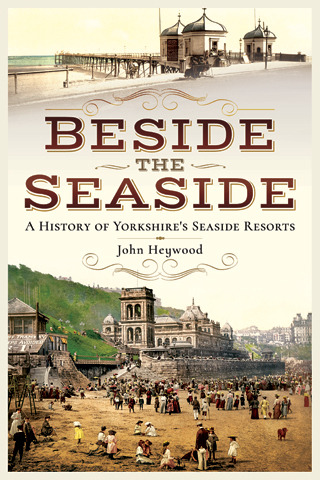 It was Henry Pease and the Saltburn Improvement Company’s inspired resort that was the first of the Yorkshire coastal towns to consider building a pleasure pier. In 1861, the construction had been approved but it was not until 1867 that work commenced under the auspices of engineer John Anderson. Connected with both the Stockton and Darlington and the South Durham and Lancashire Union Railways, he sensed profits were to be made in the evolving resort and had bought large plots of land as they became available. He was responsible for the construction of the Alexandra Hotel, which at the time was considered almost on a par with the nearby Zetland. In January 1867, Anderson was appointed both engineer and contractor of the Saltburn Pier Company, which he had formed alongside John Bell, Edmund Grove and James Taylor. The first delivery of the ironwork arrived from Cochrane and Grove of Oremseby and on 30 December of that year work commenced. According to the Newcastle Courant, the first pile of the new pier was driven in by Mrs Thomas Vaughan of Gunnergate near Middlesbrough. The cast iron pier with wooden decking was 1500 feet long and some 20 feet wide, with a landing stage for the use of pleasure steamers and other small boats. On the land side were two grand hexagonal entrance kiosks. It was to much acclaim that the pier opened to the general public in May 1869. Steam boat trips to Scarborough and Bridlington operated regularly in the summer months, as well as travelling further up the coast to Hartlepool. Bands entertained those waiting for their sailings as well as the many visitors who were content just to saunter up and down the new attraction taking in the fresh sea air. A saloon serving refreshments was opened in 1871. The pier proved to be an instant success, with 50,000 people visiting in the first six months. To boost attendance even further, the Pier Company erected a 120 feet high vertical cliff hoist, which could take up to twenty passengers at a time up and down the cliff. Looking at it now, it appears an extremely precarious structure. It must have worked, however, as it operated effectively for years until its demise in 1883. For the first three years after its opening, the pier made a profit but by the end of 1873 that return was rapidly diminishing. When a severe storm hit the town in 1875 and badly damaged both the landing stage and much of the seaward end of the pier, there was no money left to pay for the repairs. A loan that the company could ill afford was taken out, allowing the restoration to be completed in 1877. The length oft he pier was reduced by 250 feet and the supporting iron structures strengthened to prevent further damage. Upon its reopening, the pier was once again in profit. Even so, it was not to last and by 1879 the Saltburn Pier Company was in liquidation. The running of the pier was taken over by the Saltburn Improvement company who set about refurbishing and improving the attraction, adding a bandstand together with seating shielded by glass partitions plus refreshment rooms with new and more substantial buildings at the entrance. In 1887, gas lighting was replaced by electricity. 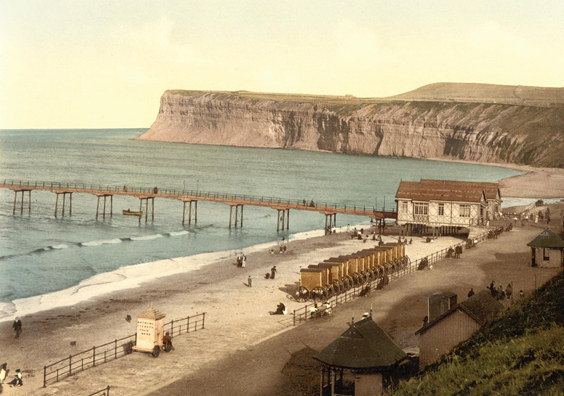 The pier became a symbol of Saltburn’s popularity as a seaside resort, with thousands visiting, especially from the north east of England. Listening to the band, promenading and even fishing in the sea below were popular pastimes. Operations ran smoothly until the night of 7-8 May 1924, when the vessel Ovenbeg, carrying a cargo of china clay from Fowey in Cornwall, repeatedly collided with a section of the pier during a storm. The result was a 210 feet wide gap. Temporary measures were put into place allowing the front section of the pier to be used. It was not until five years later that it was fully restored, with the addition of a theatre on the landside. 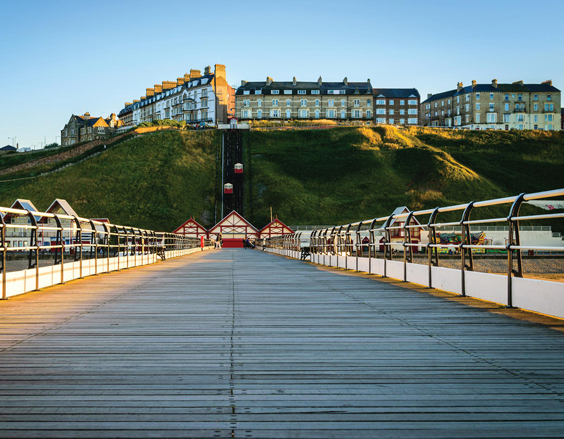 Bought by the Saltburn and Marske Urban District Council in 1938, it was requisitioned two years later by the army and a large section of the pier was removed to prevent its use in the event of an invasion. Lack of maintenance over this period saw the condition of the pier deteriorate rapidly and the end of the war found it in an extremely poor condition. Debates about who should foot the bill for the pier’s restoration and a shortage of steel, culminated in the repair work not being undertaken until 1947. It was eventually reopened to the public in 1952 at a cost of £20,000. It was reported that 20,000 people visited it in the first month. The year following saw another chapter in the pier’s chequered history, when once again a storm resulted in severe damage to its structure. Further repairs were completed five years later at a cost of £23,000. Around the same time that Saltburn was deliberating on the construction of a pier, Scarborough was thinking along the same lines. A proposal was first put forward by a group of Manchester businessmen in 1864 to erect a pier in the South Bay. Due to the usual objectors, who believed that the wrong type of visitors would be attracted and the Board of Trade, who were worried that it would be a hazard to shipping, the plan was abandoned. The next plan to be put forward was by local banker, John Woodall. A company was formed in 1865, with the majority of the investors being local businessmen and hoteliers. Surprisingly, their plan was to build the pier on the North Bay which at this time, was still in the main undeveloped. Eugenius Birch, who was to later design Scarborough’s Aquarium building, was employed to engineer the pier and on the 14 September 1866, the first pile was driven in to the ground. The construction was riddled with delays, partly due to the untimely death of the main contractor, J.E. Dowson. By 1 May 1869, thankfully the pier was completed at a cost of over£ 12,000. It was 1,000 feet in length. A shelter at the pier head allowed for band concerts to be held and refreshments to be served. Alas – the pier was not successful. Visitor numbers were low, dividends paid to investors were minimal and the company was in debt to local banks. On top of this, a decision was made to ban steamers from calling at the pier head owing to the constant damage they were causing. A vital source of both income and visitors was therefore lost. 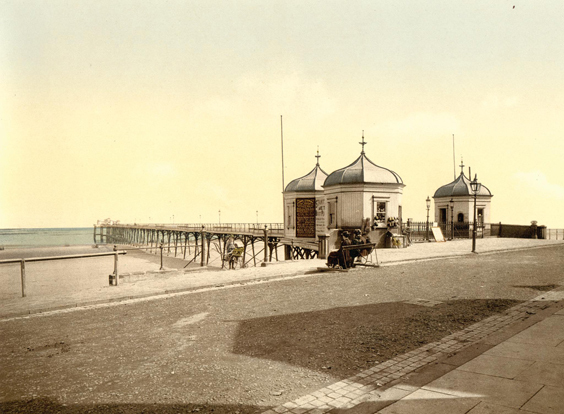 The pier never attracted the number of visitors it should have and even the introduction of performers of the calibre of Marie Lloyd did little to enhance its financial success. The pier was purchased for £3,500 in 1904 by William Morgan,w ho by then was mayor of the town. He was not to own it for long. On 6 January 1905, a combination of a severe north westerly gale anda very high tide saw the pier destroyed apart from the pavilion, which was cast adrift several hundred feet from the shore. The pier was not insured and was never rebuilt. The resort of Redcar was the next east coast town to build a pier. The resort had been expanding since the 1850s, with a seawall and promenade having been constructed in the following decade. Whilst discussions about the erection of a pier had been ongoing for some time, it was not until neighbouring twin-town Coatham had put forward proposals for a pier of its own, that action was taken. After negotiations to construct a joint pier, sited centrally between the towns had failed, both towns decided to build their own. The pier was designed by J.E. & A. Dowson, who had been the original contractors on the building of the pier at Scarborough. When J .E. Dowson died in 1868, Head Wrightson & Co. of Stockton were instructed to construct it, the building being financed by the sale of shares and by contributions from the Earl of Zetland. The report continued to describe the pier as being 1,300 feet in length and 20 feet in width. The pier head widened out to 114 feet wide and featured a bandstand with seating for 700 behind protective shields. There was also a separate landing stage for the passengers of the pleasure boats. It was estimated that upwards of 4,000 people visited the pier on the first day and 1,350 on the following day. Further damage was incurred on 28 October 1880 when the ship Luna was driven by a severe storm into the pier, resulting in damage estimated at over £1,000. Significant damage was also incurred further south at Hornsea and Withernsea Piers. On the last day of 1885, a steamer, the SS Cochrane, ran into the pier and demolished the landing stage. Without it, steamers were unable to use the pier. Additional damage was caused in January 1897 when wreckage from an abandoned ship, the Norwegian Schooner Amarant, hit the pier resulting in a sixty feet long tear. This was quickly repaired. Things though were set to get worse when in August of the next year, the pier head was burned down. The incident was covered in the Leeds Mercury. The bandstand was not replaced, but seating was reassembled on the new pier head, the total cost of the repairs being in the region of £1,500. In due course, the Pavilion Ballroom was built behind the entrance kiosks. This dancehall was extended in 1928 and a tearoom added. The pier existed trouble free up to the Second World War when, like many others, it was breached to prevent German access in the event of an invasion. During the war, a mine exploded near the pier resulting in significant damage. Already weakened, further storms made matters worse and by the end of the war only forty-five feet remained. Redcar Pier was sold to the Borough Council and £4,500 spent on renovating what remained of it. The future of Britain’s smallest pier was far from secure, but somehow it worked and the years up to the latter end of the 1970s were some of the pier’s best. By 1980, however, the pier was considered unsafe and the decision was made to demolish it by Christmas of that year. Construction of a rival pier at nearby Coatham eventually commenced in 1873. The pier was to be 2,000 in length, over 700 feet longer than the one at Redcar. In December of 1874, with the work nearly completed, a catastrophe happened that almost ended the project before it had started. In the middle of a storm with waves of tremendous height crashing towards the shore, not one but two vessels struck the pier. The Redcar and Saltburn-by-the-Sea Gazette recounted the night’s events. All the crew managed to survive the terrifying ordeal by jumping from the ship onto the pier as it crashed through it. The vessel eventually drifted away from the pier and became fast in the sand. The schooner Corrymbuswas driven into the pier nearer the promenade. The crew were all saved but the ship was lost. In all, five vessels ran ashore during the night. The cost of repairing the pier was enormous and to save on costs its length was reduced by 200 feet. The pier did eventually open in 1875 to some acclaim. It contained two pavilions, one at the centre of the pier and another inside the entrance. Used for band concerts and other amusements, the pier was quite striking. It was not, however, financially successful and was vulnerable to the vagaries of the weather. As such operating costs were high. It was badly damaged a year after its opening, when a storm resulted in the loss of a length of pier some 200 yards long. The repairs were estimated to cost around £3,000. The final nail in the pier’s coffin, however, was in 1898, when on the 22 October the pier was once again severed, this time by the storm damaged Finnish barque Birger. The tragedy that unfolded was watched by a crowd of several thousand onlookers who had gathered on the promenade to view the ship breaking up. Two Lifeboats were launched, the Redcar crew in their boat The Brothers and the Free Gardeners in Emma. The owners of the pier were unable to meet the cost of the substantial repair bill and the seaward section of the pier was demolished. When the Coatham Pier Company went out of business the pier was left to rot, eventually being dismantled some years later. A sad end to a town’s big dreams. The last two piers to be built were in the south of the region at Withernsea and Hornsea. The coming of the railways had opened the towns up for development. In the case of the former, this was championed by Alderman Anthony Bannister who formed the Withernsea Pier, Promenade, Gas and General Improvement Company. The company’s prospectus included a commitment to erect a pier in the town, the entrance of which would be situated half way along the promenade. This, along with the rest of the development never got off the ground. New plans were drawn for a pier to be built opposite the railway station. This was situated further to the south of the town with Thomas Cargill, who had previously designed the pier at Aldeburgh in Suffolk, as the engineer and J.O. Gardiner, as the contractor. Despite some damage during its construction, the 1,196 feet long pier was completed by August 1877. Built entirely out of iron, except for the brick entrance and wooden decking, the pier used the new technology of screw piles, which were driven deep into the ground.S eating was provided along the full length of the pier and a saloon and hall for entertainment was situated at the pier head. The entrance tot he pier consisted of two castellated towers, rumoured to be based on Conwy Castle in Wales. Upon opening in August 1878, the pier quickly became profitable.T he one penny admission charge ensured that it was accessible to all and not just a select few. Excursionists, especially from nearby Hull,f locked to the new attraction. Unfortunately, the success of the pier was to be short-lived. The second vessel to hit the pier was the brig Saffron, which tore a 200 foot hole through its centre before coming to rest nearby. The Saffron had been part of a flotilla of ships which had set out from the Humber, journeying northwards. Around Flamborough Head, the wind increased rapidly to a storm force gale. The fleet was at the mercy of the elements. The Saffron’s captain made the decision to head back to Hull, but its sails were torn away in the fierce winds and lashing rain. The boat was pulled further and further southwards and nearer to the coast, crashing into the pier in the early hours of the morning. Having lodged against a groyne, the crew bravely sat out the storm until first light when they lowered a ladder and walked to safety. The pier had only just been repaired when it was damaged again on 28 March 1882, the pier head being destroyed along with the saloon above it. The pier was not repaired, but the remaining sections continued in use. 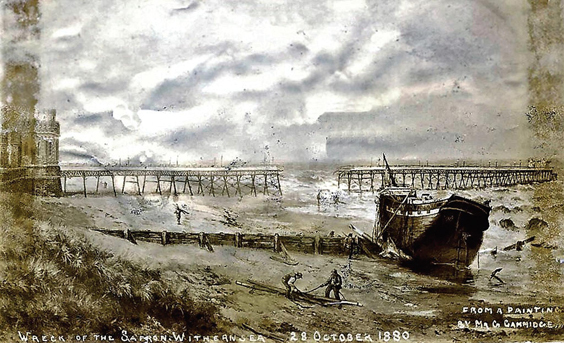 The series of disasters were relentless, and on 20 October 1890, the Grimsby fishing smack Genestahit the pier destroying over half its length, leaving just over 300 feet remaining. The story began at 4 o’clock on Sunday morning when the Genestacame aground at Waxholme, near Withernsea. The horrific events were graphically portrayed in the York Herald. The Genestahad escaped the ravages of the storm unbroken. It was quickly bought by a group of local businessmen. Before they could protect their purchase, a further storm carried the unmanned vessel up the coast to Withernsea where it crashed into the pier leaving just 300 remaining. Two years later even this was destroyed, when another vessel, the Henry Parr (formerly the Dido) rammed into it at the height of another storm. The history of the pier at Withernsea is both tragic, yet inspiring. The two entrance towers have survived all the devastation around them. They are a well-loved landmark in the town, even if many visitors are totally unaware that they once formed a part of a pier. They also act as a memorial to those sailors who perished in the seas around it. The last pier to be built in Yorkshire was in Hornsea. The town had been attracting a steady stream of visitors for a while and there wash ope that, with the coming of the railways, it could turn into a major resort. There was fierce competition between two potential developers who had bought separate parcels of land. Joseph Armytage Wade was a local businessman who ran a large timber company in Hull, whilst Pierre Henri Martin du Gillon hailed from Leeds. For a while, it appeared that the small town might gain two piers but du Gillon’s company was declared bankrupt in April 1879 as a result of the cost of court hearings between the two. With the field now clear, Wade and the Hornsea Pier Company employed Eugenius Birch to design the pier but with only a small amount of capital they were soon in trouble and both designer and contractor were working unpaid. When Bergheim, the contractors, ceased work on the construction a new firm, Fontaine and Co. were brought in to complete the work. The pier was finally opened to the public in May 1880. With the company now £2,500 in debt, it was immediately placed in the hands of the receivers. Ironically, the pier proved to be a success with visitors, probably becoming the town’s main attraction. Its life though, was to be extremely short. The vessel Earl of Derby hit the end of the pier during the infamous storm of 28 October in the same year; less than six months after it had opened, the pier head and 120 feet of the rest of the structure had been lost. The remains of the pier were slowly allowed to rot and by 1897 it was declared derelict. The history of Yorkshire’s piers has been littered with tragedy, failure and personal misfortune but also with triumphs, ambition, determination and foresight. In the end, tremendous human engineering skills were at the mercy of the raging sea and howling winds… and it was nature that won.